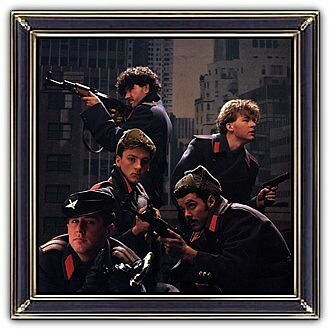 Frankie Goes to Hollywood, formed in 1980, were a British band popular in the mid-1980s. The group was fronted by William Johnson (vocals), with Paul Rutherford (vocals), Peter Gill (drums), Mark O'Toole (bass guitar), and Brian Nash (guitar). The group's 1983 debut single "Relax" was banned by the BBC in 1984 while at number six in the charts and subsequently topped the UK singles chart for five consecutive weeks, going on to enjoy prolonged chart success throughout that year and ultimately becoming the seventh best-selling UK single of all time. It also won the 1985 Brit Award for Best British Single. After the follow-up success of Two Tribes" and The Power of Love, the group became only the second act in the history of the UK charts to reach number one with their first three singles.